For all those interested in the marine environment, this article is not going to teach them anything. But for most people who have not overlooked the subject, here is an explanatory article of what you often meet at the seaside without knowing where it comes from! Well, they are balls of vegetable fibers resulting from the decomposition of the leaves of posidonia. The fibers detached from the plant, gather together and form a ball under the effect of waves and currents. These balls are called “aegagropiles” (hairball). The posidonia (Posidonia oceanica) is not an “alga” as is often thought, but a flowering plant that the Mediterranean people know well since it is an endemic species to this sea. It produces fruits that resemble small black olives. And above all, it is one of the main suppliers of oxygen! Many people consider that posidonia smears the beaches, but it helps the sand to remain fixe during the winter storms. It’s a colony of animals, specifically “bryozoans” (Electra posidoniae) that live only on Posidonia oceanica. Each individual lives in a cubicle and the small ciliated tentacles that serve to filter food and oxygen are the lophophores. The colony dies at the same time as the posidonia leaf which supports it. When you were a child, did you look for the shell with this perfect hole that you sometimes find, imagining that it will make a sublime pendant for Mother’s Day? I learned later that these perfect holes were the work of another carnivorous mollusc: the moon snail (Natica)! This incredible animal blocks its prey with its foot (muscular organ intended for locomotion) and digs this hole with its “radula” (tongue), plunges its trunk, injects digestive enzymes and aspires the animal! It is the lugworm (Arenicola marina) that digs a U-shaped gallery, and creates a hole at the surface when the sand is sucked by its trunk (head side) and a small twist tail when the sand is rejected after filtration. This nourishing activity modifies the structure of the sediment since the fine particles are brought back to the surface and the coarse elements remain deep. The lugworm is the ideal prey of flatfish and waders birds, which usually only succeed in removing the terminal portion of the tail, which is reconstituted afterwards. The hemoglobin of this worm (molecule present in the red blood cells and which has the function of transporting oxygen in the body) is able to carry fifty times more oxygen than human hemoglobin. It’s a transporter of universal oxygen which is a great interest to science to improve the time of preservation of the organs to be transplanted. 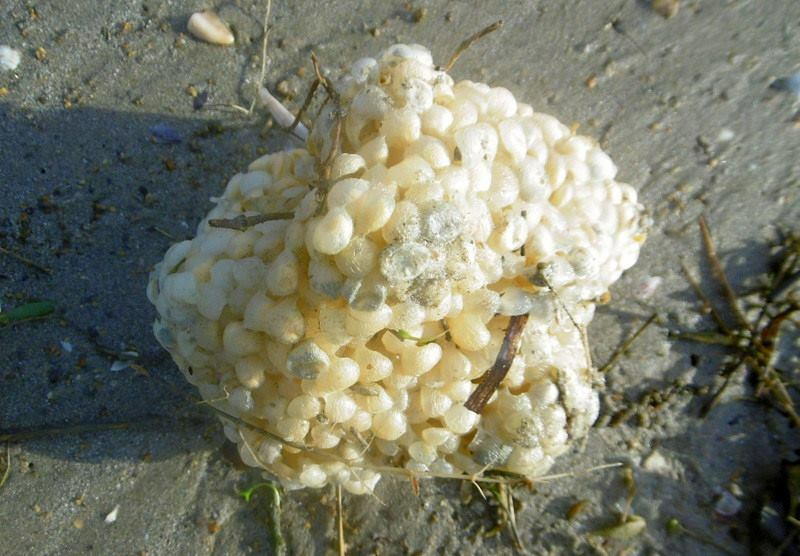 This is a whelk spawn or more precisely empty whelk lay eggs capsules. It’s called “sea soap” by sailors who used it to wash their hands. It’s a ray egg capsule, as for birds, the capsule corresponds to the shell and runs aground on the beaches when the baby ray is out. There are collections of these capsules on the beaches to help in the census of these animals, it is the program CapOeRa by the association APECS. Not easy to find the species capsules! Photos: Sébastien Moulinet, site de Port-Cros, Doris, brigoudou, lithothèque de normandie, Bernard Langellier, Les taxinomes, Lucie Papin, pixabay. ← How to improve your finswimming?